After the other employees file in, I notice that there are fewer than there were last week. Two -- out of a total of seventeen -- were laid off. One was my program manager. When everyone has had their caffeine hit -- PowerBars are also available for those desperately in need -- we move into the central meeting room with its undersized and overpriced table. The president, a graying former programmer of 50, reclines in his chair, reconsidering his State of the Startup speech. He begins by briefing us on the current projects. Microsoft-OEM is nearing completion, the TrafficView site is running and appears to be bug free. We all smile wanly as the TrafficView developers roll their eyes. Next he re-introduces our venture capital contact, a short guy with a beard named Jack who likes to talk about the New Paradigm. Jack notes that our notion that we could get venture capital easier than an STD was a little over-optimistic, but reassures us that "the wheels are in motion." A number of funds have found our outfit interesting, and are in the "due diligence" stage. Then the Chief Financial Officer, who is also the Vice President of Sales & Marketing and also Plain Old Diane, notes that given our current "burn rate," we will run out of money in two months. She looks over at the short guy named Jack. He shifts in his seat a little and remarks that, if all goes as planned, we could have venture capital in as soon as a month and a half. But selling is the only thing. And you can't move product without finding or "creating" helpless buyers who, like lemmings, are just dying to hurl themselves off of the nearest cliff to get their hands on the latest and greatest version of your Killer App. Promotion takes many forms -- from four color brochures produced far in excess to tech fairs in exotic locales -- all of which involve wasting enormous sums of money. But the most difficult and most crucial promotion occurs between company executives and Venture Capitalists. VCs are the benevolent souls who give management a few million in exchange for a vast share of the company and mandatory weekly car washes by the President. Intelligent VCs realize that your company is merely a bottomless pit and that the Elephant Car Wash does a better job, and they won't invest with you. The rest are all accustomed to dealing with lots of money but few brain cells, so they never know what they are talking about. To sell to those bozos, you need to find someone on their level. 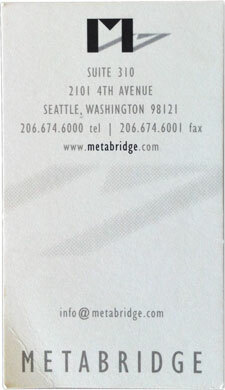 "Hello Bob, this is Jack from MetaBridge." The day winds on, the VCs come and go, and the stack of empty Pepsi cans gets higher and higher. At exactly 3:45 pm, the secretary turns the office phones to intercom, sets her phone to speakerphone, and places the receiver next to a large ceramic bowl. She lifts up the Costco-size bag of M&Ms and starts pouring, filling the office with the oddly soothing cacophony of cascading chocolate. Employees stream to her desk for their mid-afternoon chocolate rush in a semi-conscious state that only Pavlov could love. 5:00 pm comes and goes, but our eyes remain glued to the code. With the ship date looming, we all sport "Ship Happens" T-shirts. The hours roll by, and we, like Sisyphus with his rock, continue with our infinite cycle of running, debugging, and running again. As the sun vanishes and the glare of the fluorescent lights becomes especially apparent, we disperse. One by one, the office becomes quiet again. The Zen-like solitude that greets me every morning flourishes behind the locked oak door, watching my back as I shuffle away on the beige carpet.